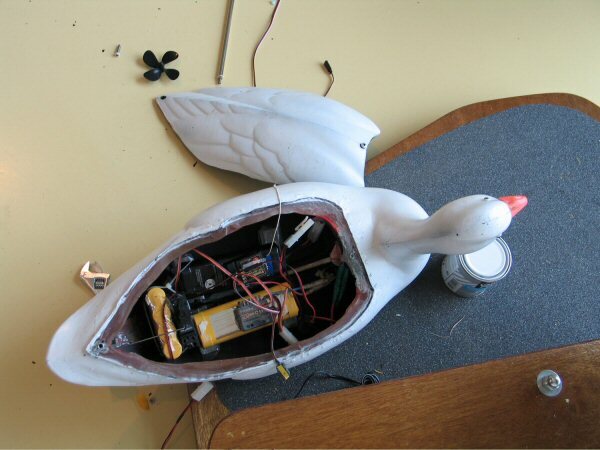 Natalie Jeremijenko, Robotic Geese, 2003. Plastic, electronic components, video camera. 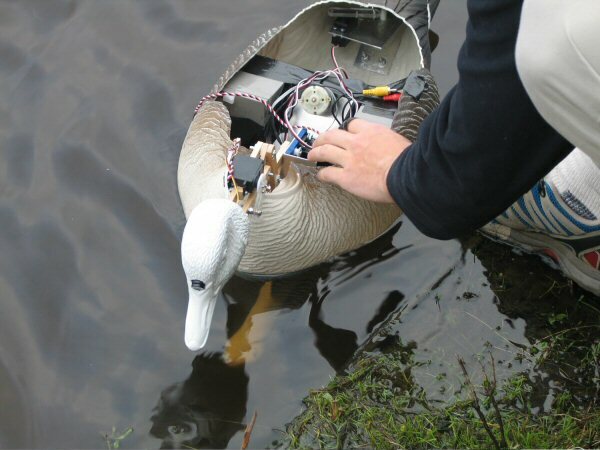 The Robotic Geese are remote controlled goose robots that enable participants to interact with actual geese in urban contexts. Design development and construction: Mike Lin, Derek Keil, Will Kavesh, Jesse James Arnold and Arthur Kingsoliver. Photo: Adat. Courtesy of Natalie Jeremijenko. Plastic, electronic components, video camera. Unlike a traditional zoo, OOZ is a place where animals remain by choice, a zoo without cages. Like a traditional zoo, it is a series of sites where animals and humans interact. However, activity at an OOZ site differs from that of a Zoo. 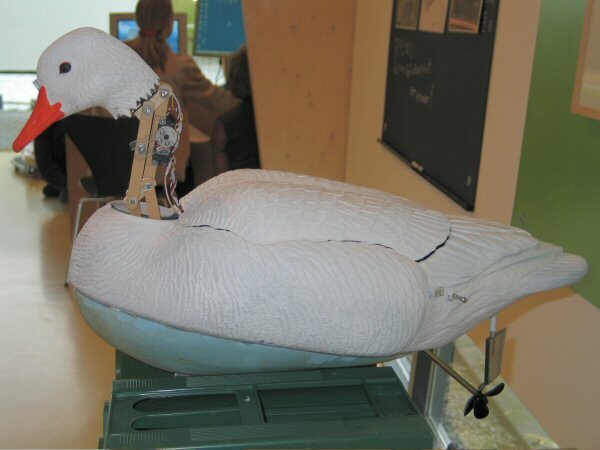 OOZ is interactive - it provides humans a set of actions, the animals provide reactions and these couplets add to a collective pool of observations. The human/animal interface has two components: 1) an architecture of reciprocity, i.e. any action you can direct at an animal, it can direct at you, and 2) an information architecture of collective observation and interpretation. OOZ addresses learning that reveals interconnections among complex natural systems and the ongoing political effect of changing someone's ideas about their role in the local environment. Indeed, fundamental political concepts are all naturalized through animals. One of the most persuasive strategies used to promote the acceptance of homosexuality has been to demonstrate its ubiquity in the nonhuman world; conversely, the argument used to estrange homosexual couples is that it is 'unnatural' - the same argument that has been used against interracial and cross-cultural marriages. The political readings of the animal world - its models of governance, territory negotiations, and social dynamics - are, as many have argued, the primary pattern from which politics is validated. As sociologist of science Bruno Latour says, "Nature, far from being an obvious domain of reality, is a way of assembling political order without due process." He too proposes an end to the dichotomy between nature and society, asserting in its place a collective incorporating humans and nonhumans. Animals rehearse new ideas of political status, even as and because they remain subhuman. Although animal models are the basis of the biological sciences and contemporary medical knowledge, it is the use of animals as social and political models that Jeremijenko makes explicit in the OOZ project. Natalie Jeremijenko is a design engineer and technoartist.